Last January we posted this blog and received tons of positive feedback from couples on how much it helped them in planning their wedding. We didn't want our 2017 couples to be left out, so we decided to run it again! I refuse to be sexist in the presumption that all men dislike wedding planning. There are plenty of males out there holding it down for the fiances who like to plan and who do it well! Whether you’re a male or female planner, we know that opposites attract, which means, in many relationships one partner likes to plan and the other does not. I am in that relationship. This isn’t surprising as I am a wedding planner. However, my man is the extreme opposite. He dislikes planning anything and would rather wait until the very last minute to throw something together and see how brilliantly things can “fall into place.” Fortunately, this actually has worked out quite well for him . . . so far. If you are planning a wedding with a non-planner, like I did, here are some tips that might help! Kelsey and I have teamed up to create a short list to aid in the task of planning a wedding with The Anti-Planner. Create a monthly schedule with reminders/tasks on a shared calendar (this eliminates the need to remind him/her countless times about a to-do item, and instead allows the calendar to do it for you! 2. MAKE IT FUN, DRINK WINE. It's easy to allow wedding talk to consume your every thought. If you are the planner in the relationship, then you know the excitement that comes with talking about the details of the wedding. On the flip side, if you're not a planner, these details can leave you feeling overwhelmed and anxious. Don’t allow wedding planning to consume your relationship. There are so many beautiful parts about being engaged that don’t involve the looming details of the party; bask in those things. Give yourself (and most importantly, your partner) a break from talking about wedding details. Instead, choose 1-2 days a week, grab some wine or go on a date where you can tackle the to-do list. Try to make these events fun! One of my girlfriends shared that every wedding task she and her fiance did she involved champagne! Registering? Champagne breakfast! Envelope addressing? Rose Champagne! Guest list? Champagne and tequila! 3. DELEGATE BASED ON INTEREST AND TALENT. We learned this in our pre-marital counseling. Pre-marital counseling is a great place to discuss delegation and any decisions that have been hard for you and your partner to agree on. (Add to your To-Do List: Sign up for pre-marital counseling). We learned that each person brings strengths to a marriage. Find those strengths in one another and use them to your advantage when delegating tasks. If one person is really artistic, let them take on stationary, or if one person is a total foodie, let them take the lead on catering. 4. REMEMBER THE DIFFERENCE BETWEEN A MARRIAGE AND A WEDDING. A marriage is about two people committing themselves to a life together. The wedding is a party. That is it. Keep this in mind through the whole process. Your partner wants to marry you and spend everyday with you for the rest of their life. That doesn’t mean they have to want or like planning the party though. Try to separate these two things and don’t take it personal. 5. WEDDINGS ARE A LOT OF FUN, AND A LITTLE STRESSFUL. Before I got engaged it seemed that everyone kept telling me how stressful it was planning their wedding. Until finally a girlfriend told me how fun it was! This wasn’t because she was the best planner alive or because her fiance just adored all things wedding related. It was because she had the best attitude! Its like the book The Secret- those with the best mindset will have the best lives. My friend went into her engagement with a mantra: this is going to be fun and I know at times it will be a little stressful too (I mean duh, its a wedding, of course there will be stressful moments!). 6. HIRE A WEDDING PLANNER. I know this sounds like a business plug, but I swear it's not. I say this to you as a wedding planner that planned her own wedding. Make wedding planning a line item. Find a planner that you love and trust. Let him or her be the nag, the coordinator of all things business and contractual about the wedding, let her take on all the stress of the details, while you get to sit back, enjoy being engaged and in love. This gives you the opportunity to be involved in the aspects of the wedding that you are excited and interested in, while the planner takes care of the rest. If you don’t want to be the one nagging your partner about the million and one details about the wedding, do yourself (and your fiance!) a favor and hire a planner. We all see the fabulous ideas on Pinterest- "how to" just about any and everything, from table settings to your very own wedding altar. But the bride that decides to over do the DIY projects is the bride that finds herself in her 90 degree kitchen, making 100 batches of "homemade" granola as a lovely parting gift, only to be disappointed that most guests forgot the granola on their tables (true store- my best friend did this!). The issue with DIY projects is that they are never as easy as they seem and always end up costing twice as much as expected. They often begin as an idea that seems like a fun wedding project but end up being an overwhelming task that just has to get done. Trust us when we say you will have plenty to do before the big day, so limiting any extras will save your sanity. The sad truth is most DIY projects don't actually enhance the wedding experience. Your guests are not going to remember the hand painted vases that you spent an entire day on (and only to save a fraction on rental fees). 1. Our advice is to not DIY. Save yourself the time and money and usually stress and just buy it! I love to DIY, but for my wedding I'm not doing one single DIY project and I'm happy as a clam about that. 2. If you have to DIY- leave it up to others to do it for you. My mom is super creative and has sewn all my life. She offered to make my veil and I happily obliged. Its the most beautiful and special thing that I have ever seen and I'm so glad she did it. However, we went into the project 6 months prior to the wedding and with the understanding that if it doesn't work, we will simply buy one. I did nothing. I tried on a veil 3 times and it was created and made for me. The best project I've ever helped with! 3. If you, yourself, has to DIY something, do not, I repeat, do not take on a task that most people pay others to do for a wedding- such a flowers. For a split second I actually thought I would make my own bouquets. I quickly realized this was probably the worst idea ever. People make a living creating gorgeous bouquets and floral arrangements, who am I to try to replicate that on a whim and only on the biggest day of my life thus far? 4. If you, yourself, has to DIY something, start early. Whatever you do, do not wait until the month of your wedding. You will be stressed and this fun task is no longer fun. Keep it fun and do it early! And remember, for every wedding task, there must be champagne! 5. If you, or anyone else in your wedding decides to DIY, have a back up. Do not get stuck without a second option. Or be OK that you may have to scrape the idea all together if it doesn't work out how you hoped or planned. I leave you with this- save the DIY projects for your girlfriend's baby showers, engagement parties or home remodels. Mothers of the Bride (and Groom) are among the most honored and special guests at a wedding and so, their attire should certainly fit that title. My own mother has had quite the dress shopping adventure in finding a dress for my wedding. On countless shopping trips we have searched for gems, among dresses that are, oh so typical, schoolmarm or just plain boring. My mom is nothing short of boring and why should she be forced to wear shades of neutrals and bland? Luckily with some guidance, MOB's (Mother's of the Bride) can show up looking just as fabulous as they really are! You can NEVER be over dressed, you're the MOB! Stop thinking you're going to be too dressed up, there is no such thing! You set the tone, you are the queen guest! You can wear ANY color (except white). Why should you be summoned to beige, or light pink, or any other color that isn't 100% you? Don't be afraid to stand out in a color that fits you; fuchsia, emerald, or better yet, floral! There are many fabrics besides lace. 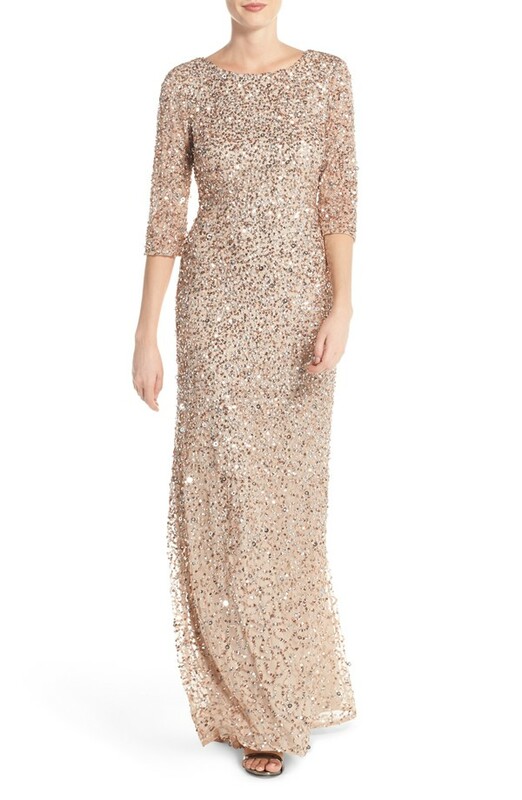 Lace is gorgeous and timeless, but if you dare, try something with a little more flair, like sequins! The MOB can never be too sparkly. All dresses found at Nordstrom. Happy dress shopping MOB's. Dad's we have you covered too, coming soon! Planning your wedding while planning other couple's weddings is both very exciting and creative and at the same time brings about many challenges. My world is currently weddings x2. My career is solely wedding focused, while at the same time so is my personal life. My Instagram is covered with a million wedding inspirations daily and it is my job to keep up on these trends- however, boy oh boy odes that make decision making much harder! Sometimes I can't help but think . . . I finally settle on a style, but then suddenly I see five other invites I love and am quickly convinced my decision is the "wrong" one. What does that even mean, right? There is no right or wrong in design, but yet, it is so easy to lose yourself in these decisions. I have found it to be much easier to create and envision other people's wedding design because my emotions are not tightly bound to each decision. I can look at someone else's wedding and think quickly and easily- this will look the best, this will work the best, but your decision making brain is quite jaded when you're planning your own wedding! Early on I told Kelsey, "I need to hire you!!!" But confident (perhaps too much so) in my planning and design abilities she said, "No you got this." I think the most important thing to remember is there are a million and one ways to do this wedding thing. And likely, your style is going to change- especially over an entire year of planning. Those poor 80's brides, right? There will be elements that are timeless, but there are elements that you might love during the planning and totally dislike when the wedding day comes (remember our dress anxiety bride?) or elements you love all the way through but years later look back and say- "Why the heck didn't I spring for floor length linens?!!" Whether you are working with a planner or planning your own wedding, don't be tortured by these decisions (note to self: remember this advice!). Be confident in what you like and don't like be OK with the fact that it won't be perfect either. Insert *Bridechilla* mentality here. You may also be constricted by a financial budget which will dictate some decisions- this can actually be a good thing to help narrow down choices- yay to budgets! Every bride I've ever spoken to (except . . .) walked away from their wedding saying it was everything they ever wanted because they married their soul mate that day. And nothing- not even short linens can take away from that moment in time. This morning Kelsey and I ventured out to Hood River Oregon to check out the venue of a July wedding we will be designing and coordinating. Its quite amazing what site visits do for the planning process, especially for destination or out of town venues. Yes, we drove for 2 hours just for a 30 minute walk-through, however the visit was priceless in the planning process. As a wedding planner it is our job to know the ins and outs of the space, how it will function with the given guest count and how vendors will be able to navigate the space. We represent countless vendors through the planning process and its our due diligence that allows them to do their jobs to the best of their abilities. Site Visits help to ensure that a space is suitable for the vision you are creating. Often times event spaces look drastically different (for better and sometimes for worse) than their online photos. Its like picking out a college- you don't truly know what a venue will be like until you get there, walk around, sit in the space, and feel the ambiance. Sometimes you are pleasantly surprised by what you may find or unique ways in which to use the space. Just today, we asked the Venue Coordinator how he typically sees weddings being set up and his response was honest and yet so true- "the space was designed for weddings to be set up like this . . . however, most people do them every which way but this set-up." Walk-thru's of your space make it possible to see all the ways an event can work and certainly the most efficient ways. Especially when booking outdoor venues. Where is the electrical? Where is the water? How many garbages are there and who’s responsible for their disposal?? Where will the sun be at 5:00 PM on July 2nd, 2016? And the list goes on! Guests lists truly never end if you do not put an end to it yourselves! When we start writing on paper, all of a sudden we have our friend from first grade that we have not spoken to since, our little league coach and our elementary PE teacher, all who seem to make the first round of cuts! It is exciting to be engaged, there is no doubt about that, but I always ask couples to really think about who has been in their lives and who will continue to be in their lives for years to come with more than just a physical (or social media) presence. Consider me old school, but I am a firm believer that every guest that is important enough to be invited to your wedding, should be given a +1, whether they currently do not have a partner, have had a partner for one month or have been with someone ten years. Who wants to attend a wedding without their significant other if they have one? It's not our place to determine the longevity of their significant other, and I find it happening more often than not to keep guest list under a certain number to coincide with budget. Kick that idea to the curb! Everyone deserves a plus one, so make room for your loved ones and their partners and that should really allow you to determine who you want at your wedding day and how to navigate guest list and finances. Backtrack to my earlier blog regarding budget and make sure this same conversation is happening with your parents, because they tend to be the ones who have the habit of tossing in names of people you may not feel as close with and that should also be addressed as well. It is important to be surrounded by the ones you love on your wedding day, so make every name count. You won't regret it.